For the past two weeks, my classroom joking and exuberant lectures have been complemented by chanting. Now, a lot of chanting happens in India. I have already discussed my enjoyment of the Islamic prayer chants that come through our window on quiet evenings, a calm and meditative song that seems to wish up good night. The Hindi and Sikh temples do not broadcast their chants, but walk by when a service is in session and you will hear the congregations chanting to the glory of their God/Gods. The chanting outside my classroom is of a decidedly different nature. I will not even attempt to write the Hindi, but the crude translation is “Death to __________________, Death to ____________’s wife, death to _________________’s children.” Over and over again. All day long. Now the ____________ is not meant to imply a fill in the blank. The blank is someone’s name, whom I will not divulge because, one, I don’t know the person, and two, there is no way I could possibly spell his name right. But his death is called for, and it is called for loudly at the front gates of my school. So, here is the story. An NGO (Indian version of a non-profit) named CLEAN was hired by the school to manage waste and recycling at the school and the various school-owned properties, including my house. 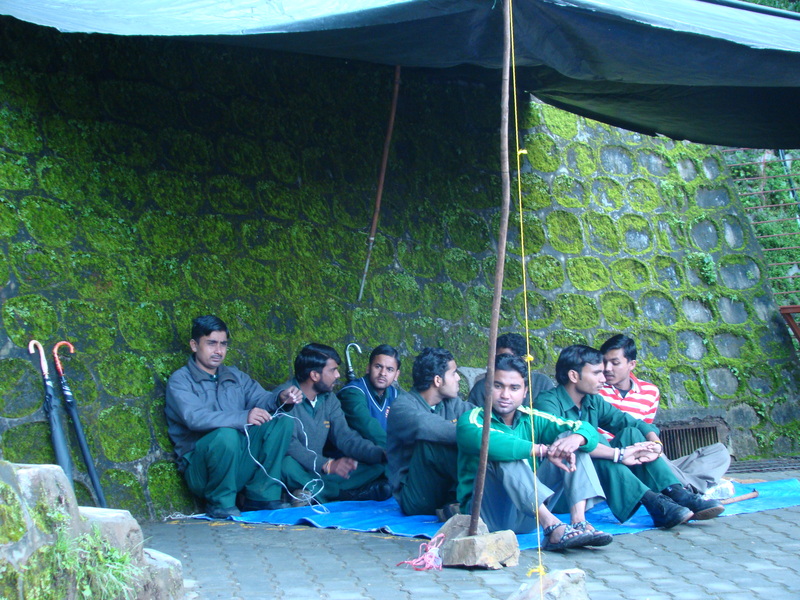 Their stated mission was to keep the city of Landour clean. Their main duty was to gather trash, recyclables and compost and ensure that each was disposed of properly. Here is where is gets tricky. The mountain, to my eyes, looks much cleaner than most of Mussoorie, but there were apparently complaints about the performance of the group. Namely, a penchant for dumping trash over a cliff edge instead of lugging all the way to the disposal facility. As I said, to my eyes the mountain is pretty clean in comparison, but many different people were complaining about the piles of debris that kept growing at the bottom of certain cliffs. And honestly, I can understand the impulse, though not the action, of dumping trash instead of walking it up the long and steep mountainside. Then it gets murkier. According to some, the NGO had plenty of warnings and discussions with the school about performance issues, which led nowhere. So, a few weeks ago, their contract was terminated. According to the workers, there was never a discussion about their performance, and they have still not received a reason for the contract’s cancellation. My school is the NGO’s largest client, so the cancellation of the contract meant the firing of several dozen employees. 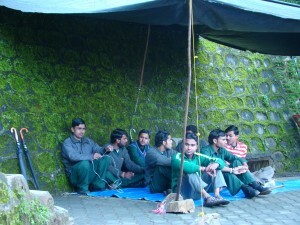 These ex-employees are the ones currently camped out on the school’s front door. The back and forths have been endless. And I honestly don’t know who to believe. The fired workers believed they had lifetime contracts, like other employees at my school. My school maintains that the people were employees of the NGO, not the school, and so had no expectation of a contract. The protesters says my school employees (the Indian workers) are prepared to join them in the strike. The administration disagrees. Many of the fired employees told me their family had worked for generations for the school, and that they were entitled to a job. And in a country where jobs and money are scarce for lower income people, they have to fight for every rupee. Even during my English class. This leads us back to ______________________. I don’t know exactly who this man is, but everyone at my school says he has absolutely nothing to do with the cancellation of the CLEAN contract or the firing of the employees. He is just a rich, Indian alumni of my school, who has a lot of sway in the town. So, his death, and the death of his family, is called for. Luckily, ______________ is single with no kids. I have no idea how long these people will be there chanting. I do know they have an attorney and a elected official sitting with them. It could last all year, I suppose. Many of my students say they should stop protesting and go find jobs, but they don’t realize how difficult that is, especially in the town of Mussoorie. Whatever happens, it is a mystifying glimpse into the economic lives of India’s lower classes. Where menial, low-paying jobs are handed down from father to son for generations. Where it is more efficient to sit daily and chant for the return of your job, because there is no other way of making money. Where the death of a wealthy person is called for in the street, even though he apparently has nothing to do with the situation. And where hauling garbage is a job people will strike, and potentially kill, to keep safe. decided to throw ours down. I have nothing sensible or useful to add. You did check to make sure you don’t in any way look like ____________, right?